Located in Harrisonburg, Virginia, the Joshua Wilton House is a restored Civil War-era home within the city’s Historic Old Town district, converted into a fine dining restaurant and inn resort. Joshua Wilton was born in Ontario, Canada and migrated to the Harrisonburg region at the age of 22, following the American Civil War and the renewal of employment and land ownership opportunities in the American South. Wilton established a hardware store in 1868, and over the following decades, became one of the community’s prominent civic and business leaders. With his business partner Philo Bradley, Wilton started the Harrisonburg Foundry metal casting factory in 1856, which continued to operate until 1963. Throughout his career, Wilton also established the city’s Young Men’s Christian Association, served as president of its First National Bank and treasurer of its Masonic Temple No. 27, and was a member of its City Council and Rockingham Hospital Board of Trustees. In 1880, Wilton began constructing a Queen Anne Victorian residence within the city’s downtown district, in the area that is now designated as its Historic Old Town district. The home was constructed over the course of eight years, with assistance from a number of regional and national architects, designers, and crafters. Following the home’s 1888 completion, Wilton’s family resided in the house for four decades until its sale to the Shank family. The Shanks resided in the home until the 1970s, when it was converted into a fraternity house and later an apartment building. In 1986, the home was purchased by the Moore family, who restored it to its original historic condition over the course of the following two years and added a restaurant kitchen, sunroom, and brick patio to its premises. 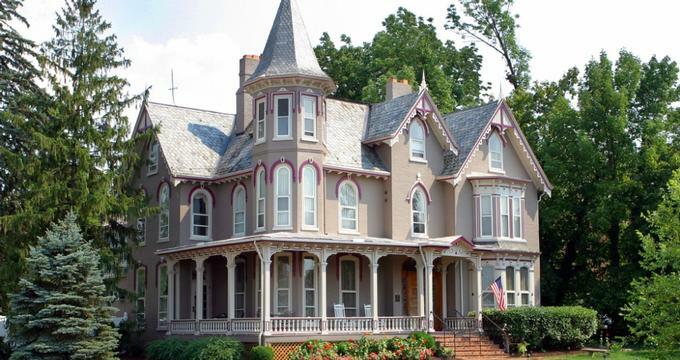 In May of 1988, the home was opened to the public as the Joshua Wilton House Inn and Restaurant, the first bed-and-breakfast facility of its kind in Harrisonburg. Though the home changed hands through several more owners throughout the late 20th and early 21st centuries, it remains operation today as a bed-and-breakfast facility. In 2015, the home was purchased by owners Rodney Eagle, Joe Irvin, and Jeff Hill, the proprietors of Harrisonburg’s Local Chop and Grill House restaurant. The home’s new owners shifted its focus to French-inspired cuisine featuring farm-to-table ingredients and an extensive wine list. The house remains in its historic condition, showcasing the intricate fireplace and mantel work originally installed by Wilton, along with a central stairway with newel post, parquet floors, and a preserved historic front door encased by leaded glass. The Joshua Wilton House is open for dining Tuesday through Saturday evenings, with special Sunday brunch and Saturday afternoon tea hours offered periodically. Menu items are rotated throughout the year, with a focus on French-inspired dishes such as filet mignon, beef tartare, mussels mariniere, and mushroom risotto. An extensive wine list is offered, along with specialty cocktails and after-dinner drinks. Classic French desserts are also offered, including creme brulee and speciality cheesecakes and bread puddings. The Joshua Wilton Inn is open seven days a week for overnight stay, with reservations available via phone or online. Five inn rooms are available at variable rates, with all rooms showcasing period-appropriate Victorian furnishings. Room options offer views of the home’s patio and gardens, as well as amenities such as fireplaces, armoires, and canopy and four-poster beds. Full gourmet breakfast is included with each night’s reservation rate, and access to private bathrooms, temperature controls, and house wifi is included with stay. All rooms are non-smoking, and children under 12 and pets are not allowed at the facility. Corporate or group rates are available upon inquiry by calling the facility. Afternoon tea events are offered periodically throughout the spring, summer, and fall months, with private tea reservations for small groups and organizations available during the winter months. Sunday brunch is offered weekly at the restaurant on Sunday mornings, with menu items focusing on a blend of French-inspired dishes and traditional American Southern cuisine. Brunch menu items include croque madame, quiche, eggs Benedict, and Appalachian-style grits. Special Date Night menus are offered on Tuesday nights, and happy hour beverage and appetizer pairing rates are available on Wednesdays. Private afternoon tea events may be booked by contacting the facility directly via phone or on its website through event inquiry forms. The house may also be rented for private special events, including weddings, reunions, and corporate events. A special catering menu is offered in conjunction with the Local Chop and Grill House for private and community special events, featuring a variety of French and American Southern inspired menu items.